The Land Of Dragons and Druids. Many travellers to planning a trip to Britain focus on London, Edinburgh, maybe a trip to Stonehenge, a guided tour of Shakespeare's Stratford and perhaps a visit to the Roman cities of Eboracum (York) or Deva (Chester.) The true delights of Britain are well of the tourist trail though, we keep them for ourselves. The adventurous traveller should remember that Britain is made up of three countries each with its own history and distinct culture. The smallest of these nations is as rewarding to visit as either of the others and has more that is worth exploring crammed into its two thousand square miles than you might find in a million square miles of the central Asian steppes. One lifetime is just not enough to do justice to Wales. The Principality of Wales is always associated with Druidry because it was here, in this remote and rugged place the Romans never truly conquered, along with the other remote parts of Britain, Cornwall, Cumbria, the west of Scotland, that the old religion survived the Imperial oppression. Wales is a land rich in history and areas of scenic beauty, from the tiny fishing villages that hang above the rocky shores of the west coast, throughout the Lleyn Peninsula of the north and the Isle of Angelsey (Ynys Mon or Mona to the Romans) and down to the south there is a wealth of attractions for the mature visitor plus a few theme parks to appeal to the kids in the more populated south. 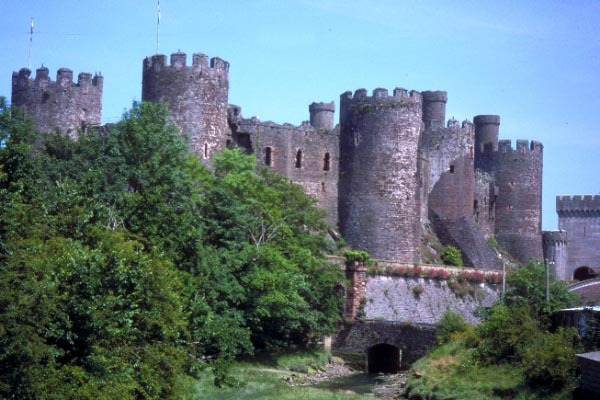 After Druids the first thing anybody associates with Wales is Castles. There are far too many to cover in one article so we will be selective (i.e. stick to the ones my editor and I have managed to photograph) We shall make this a tour of castles mainly because they are photogenic but on the way we will stop off at other places of interest. One of the best preserved and probably the most familiar is Castle in the north of the country. This is still used for administrative purposes and was the scene of the investiture of H.R.H Prince Charles as Prince of Wales in 1969. A little further along the coast stands Conwy Castle. For those with the energy to climb the steep spiral stairs that lead to the top of the highest turrets there are spectacular views across the estuary of the River Conwy. 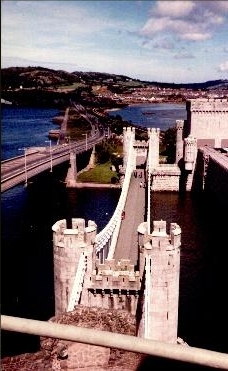 Looking down from the west turret of the Castle (view pictured left) at the road and railway bridges over the river estuary it is easy to see how a fortress such as this would control access to the land beyond. West of Conwy are the mountains of Snowdonia, a remote and inaccessible region that the Welsh would withdraw into when under attack. 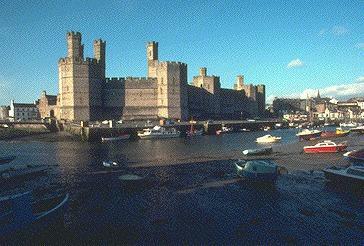 The ancient walled town offers many attractions including, situated on the harbourside, Britains smallest house. There is a story that the individual who lived in this house was an exceptionally large fisherman and his bedroom was so small he had to sleep with the window open and his feet protruding. 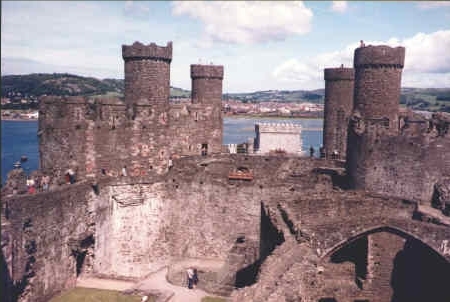 This view (below) of the interior of Conwy Castle give an idea of its scale. Wales has so many legends it would be impossible to cover them all here. 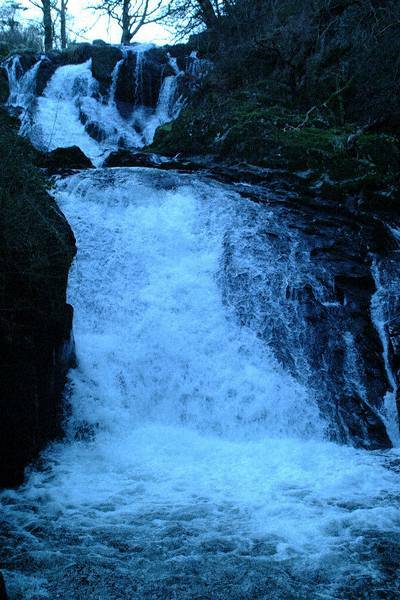 In the area we visit for the first part of our photographic tour there are many stories connected with the legend of King Arthur. The Seige Perilous and The Holy Grail. 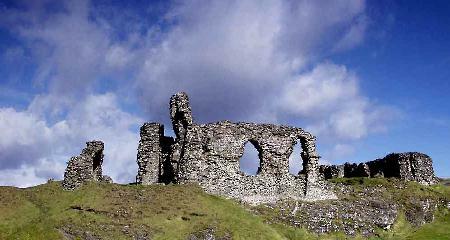 Dinas Bran is reputed to be the Grail Castle of Arthurian legend. If you have read the tales of King Arthur and his Knights of the Round Table you will recall the Holy Grail, or perhaps the film Monty Python and the Holy Grail is your only acquaintance with the legend. No matter, the Grail in question was reputed to be the cup from which Jesus drank at the last supper. A Grail was a large drinking vessel, said to be about the size of a human skull. Aha! now we find if you were paying attention when you read An Ashless Fire. 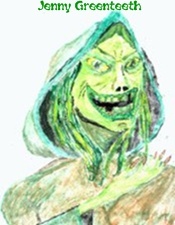 Remember the legend of Keridwen and her cauldron from which all could feed but which contained three sacred drops that could only be drunk by the pure in heart. Consider the ritual of the Holy Communion, the bread and wine symbolising the flesh and blood of Jesus which can only be supped by those who are free of sin through the absolution of the confessional. The three drops, the holy trinity of the Christian faiths? We start to see how the myths and legends of older faiths are absorbed into the more modern ones. Christians will protest here of course (if they have not abandoned me ages ago) but I hope you will be intrigued enough to look more deeply into the ancient myths. What you will find in this the fictions of this collection only scratches the surface and has been moulded to fit my whim as a fiction writer. The Grail became of paramount importance to Arthur and his Knights because in the legend they believed those who possessed it would bring peace and prosperity to their land. It seemed that Sir Galahad the Pure would be the chosen one who found the Grail but in the end Galahad's self conscious purity betrayed him because it was self serving. The man who put the salvation of his own soul before the needs of others was not to be the chosen one, that honour fell to the good and noble Sir Percival, a Knight who did what had to be done in order to achieve the greatest good who eventually solved the mystery of the Grail. Symbolism again. One who consciously shuns sin is passed over in favour of one who loves his fellow men. Now where have I heard something similar before? If Dinas Bran was the Grail Castle - and another version of the legend has it that the search was made on behalf of Merlin who had to retrieve the nine keys of the realm of Albion; eight could be brought to the wizard but the ninth he had to discover for himself - it is likely that the present ruins are of a fortress built on the site of an earlier hill fort. Even so these remnants predate the Norman Conquest of 1066. Many of the pre - Christian legends are incorporated in the stories that assert the separateness of the Welsh Nation from England. 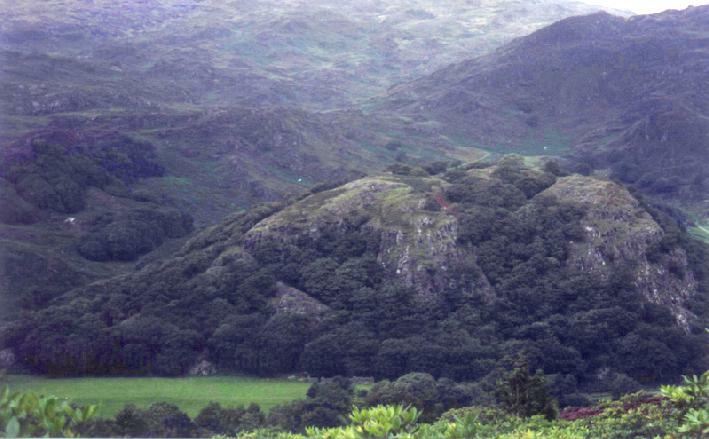 One such is the legend of Dinas Emrys. Emrys or Ambrosius is another name given to Merlin, in fact some stories refer to the wizard as Merlin Ambrosius. 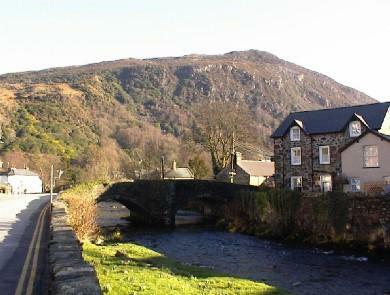 When the Vortigern or High King wanted to build a stronghold at the town of Beddgelert his masons found that as soon as they made any progress on the chosen site the ground would start to shake and the walls would collapse. A wise woman told the King that he must send for Merlin as beneath the hill was a cavern in which two dragons fought. When Merlin arrived he opened up the cavern by magic to reveal a Red Dragon (representing Wales) and a White Dragon (representing England) As the King' men gathered to witness the wonder the two Dragons fought as the did each day. On that day the red Dragon of Wales was victorious giving the King an omen that the Castle could be built. As there is not much of it left we must wonder if the fighting Dragons destroyed it or the English armies. 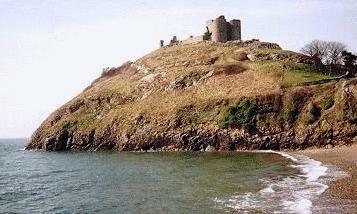 Both the Castle and the legend predate the Norman Conquest so the story must refer to the advance of the Anglo Saxons. Even under King Alfred the Great who first unified England as a single nation the Saxons did not penetrate this part of Wales so the legend does hold up. 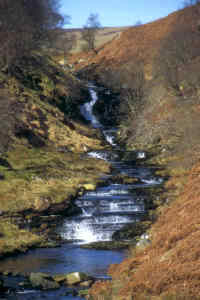 Just as nowhere in Wales is far from a Castle, wherever we are a waterfall is not far away either. 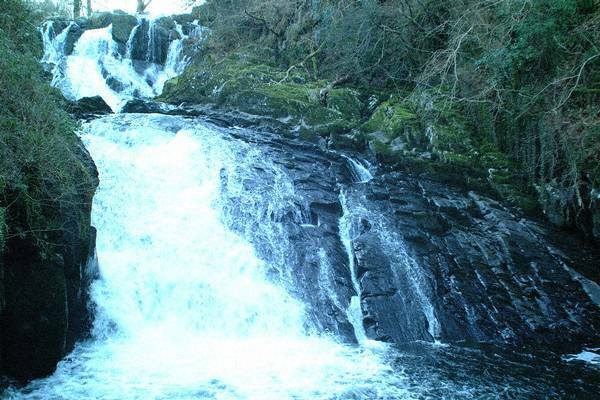 Perhaps the most famous cascades are the Swallow Falls at Bettwys - y - Coed, inland from Conwy. Though not particularly high and not arrayed ascross a wide river the falls are a favourite haunt of artists and photographers simply because of the beauty of the setting. 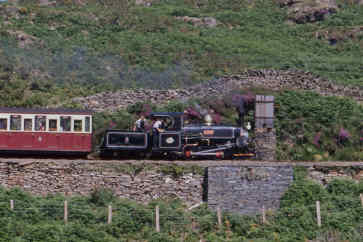 A good way to see the interior of Snowdonia and enjoy in full its scenic beauty is to take a ride on the Blaneau Ffestiniog light Railway. This route takes us past Llangollen, home of the Eisteddfod or festival of singing, which attracts singers and musicians from all around the world. Luciano Pavarotti once sanfg here early in his career. The railway, built to serve the slate quarries of the area and carry stone that would provide rooves for the rapidly growing cities of Manchester, Liverpool and Birminghan was for many years an artery for the main industry of a propsperous area. When modern materials replaced slate for construction purposes the town declined rapidly but now is revitalised by tourism and rural industries. 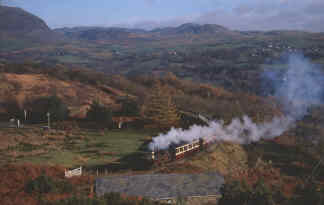 Picture above: A Ffestiniog bound train steams through Snowdonia. The long haul. The engines were designed to cope with gradients and curves a standard railway could not negotiate. All the engines have their own colour scheme and the people who maintain and operate them claim that they have very different personalities too. 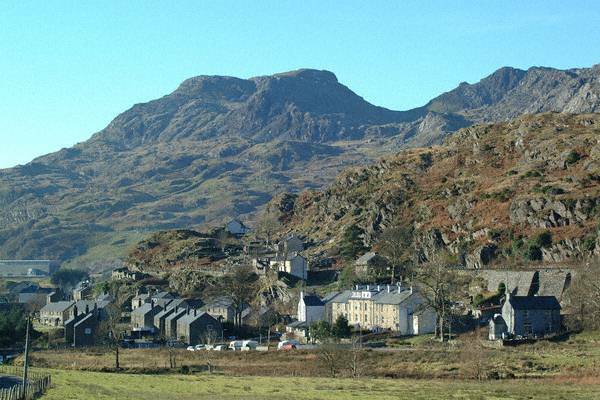 An aspect of the town of Blaneau Festiniog and the overshadowing mountains. A stop on the line that should be mentioned for an interesting local legend is Beddgelert. Gelert according to the story was the favourite wolfhound of Prince Llewellyn, a medieval Welsh nationalist who harried the English as they tried to subdue his land. The story goes that one day, having business to attend to Llewellyn left the wolfhound lying quietly in the chamber where the Prince's baby was sleeping. The castle was unguarded and somebody carelessly left the doors open. While the Prince (and presumably all his knights, men-at-arms and able bodied servants were otherwise engaged a wolf crept into the castle and ignoring the kitchen with its supply of fresh meat, headed for the nursery. Aroused by the smell of the intruder Gelert leaped up and fought the wold, killing it easily. Then not wanting the queen and her ladies in waiting to be alarmed by the wolf's body the chivalrous dog took it away into the forest. Unfortunately wolfhounds are not so hot with a mop and bucket and so the spilled blood stayed on the floor. When Prince Llewellyn returned his dog went bounding out to greet its master and he wondered why there was wet blood on Gelert's fur. On going to the infant's room he saw the empty cot and blood on the floor, jumped to a conclusion and killed the heroic hound with a thrust of his sword. Later the baby was found gurgling (in Welsh) happily in Gelert's kennel and a woodsman reported seeing Gelert dragging the dead wolf into the trees. Llewellyn was overcome with grief and guilt and had the dog buried honourably, naming the place Beddgelert so that people would never forget the injustice he had done to a noble animal. I have said there is a grain of truth in most myths. Unfortunately the only truth in that one is that Welsh businessmen like their counterparts the world over are quick to spot an opportunity and when in the nineteenth century visitors started to arrive in considerable numbers the story was invented and a suitably antique looking tomb built to help boost trade from tourists who liked a sentimental story. The town is charming and the surrounding scenery spectacular though so there is plenty for the modern visitor. Further south we hit the Southern Coast of the Lleyn peninsula. 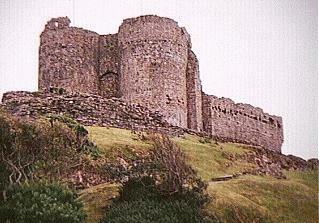 Criccieth Castle is a small fortress and completed late in the Castle building age. It is impressive though because it is situated on a rock promontory high above the small town which was birthplace to David Lloyd George, one of the 20th century's most famous politicians. The twin towered gatehouse dominates the view of visitors arriving in town and heading for the seashore. These round towers are more in keeping with English architecture although the Castle is attributed to Llewellyn the Great, the last Welsh leader to truly assert the independence of the Celtic nation. 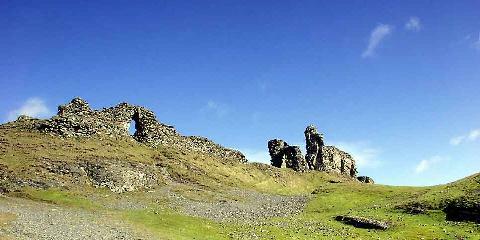 Maybe after King Edward 1 of England overran the country he altered the castle to symbolise English dominance in this remote and rebellious part of Wales. Photographs of Dinas Bran and Dinas Emrys courtesy of Bob Jones, Bodafan. Photographs of Festiniog Railway courtesy of the Festiniog Railway Company Trust. Religion and Science have in recent times not been comfortable bedfellows. Strange then that the earliest scientists were priests, people who chose todevote their lives to the pursuit of knowledge and understanding. One early science much derided by modern scientists was Alchemy, the quest to turn base metals like lead into Gold. But was the althemists idea really daft?